Raised in London, Ontario, Ted Goodden has devoted much of his career as a stained glass artist and restorer to preserving local history. Goodden’s introduction to stained glass occurred while he was studying psychology at McGillUniversity in Montreal. He visited Theo Lubbers’ Montreal studio, and soon after accepted a three-year apprenticeship with Lubbers before going to England to apprentice with Patrick Reyntiens. He returned to London in 1979 and became an integral part of London’s artistic community. Among his lasting tributes to the city are a memorial window to artist Greg Curnoe (I’ve Been Thinking About Greg, 2003) and his stained glass views of the Talbot streetscape, a section of London’s historic downtown that was demolished despite an eight-year community campaign to save it (1982-90). Blackfriars Bridge is one of 36 views of the historic bridge that Goodden completed in 1985. That year, the twelve windows comprising all 36 views were installed in Centennial Hall’s main entrance as well as at the London Regional Art and HistoricalMuseum (now Museum London). 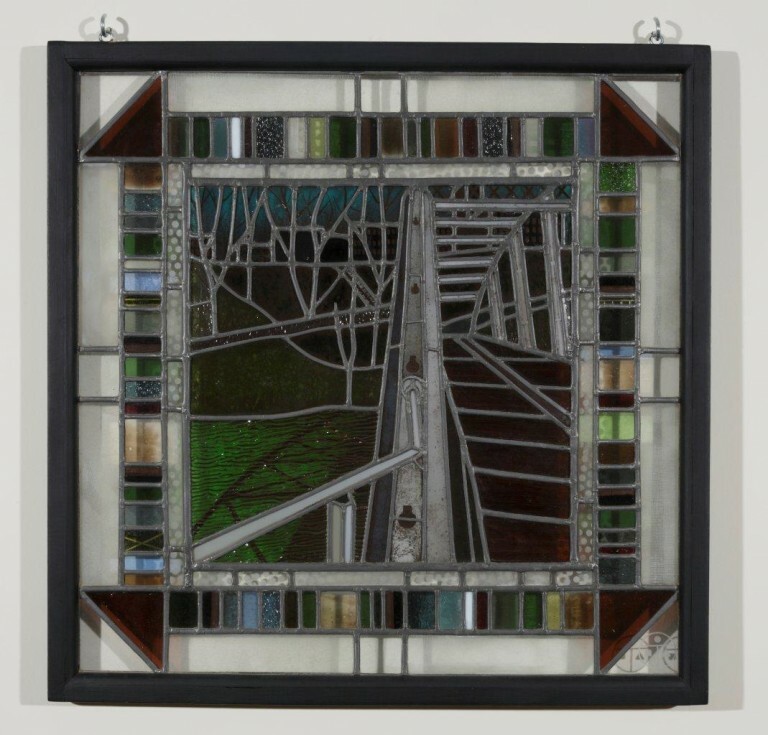 In this view, an unusual perspective and careful attention to the shared patterns of metal, wood, branches, and shadows create a dynamic composition, affirming Goodden’s ability to reimagine the creative potential of stained glass.